When our daughter Sarah was in 7th grade, her Latin Class held student chariot races—reenacting a sport that began in ancient Greece. Sarah’s goal was to build the best chariot so she and her team could win the competition. It was a fun school project, and one that had the potential to help Sarah learn resourcefulness—the ability to find and use available resources to achieve goals. Like most parents, we wanted to help our daughter in her quest to succeed. So, we came together as a family to build the best chariot possible. Sarah had an advantage over her classmates—her father was an architect with great design ideas. He was also a talented woodworker! The truth? Sarah’s team won because of her father’s talent and resourcefulness, not because she and her teammates learned important processes like planning, designing, experimenting, and problem-solving. Our family’s story, and many more like it, occur every day in the lives of our children, from elementary through high school. Whether the goal is to build a chariot, create the best science project, write a good term paper, or generate a creative assignment of any kind, kids want to achieve goals, and parents want to help. We can’t be our children’s sole resource. When parents do most of the planning, organizing, problem-solving, and work for children, we rob them of the opportunity to become resourceful themselves. I often cringe at how often we helped our daughter in this way and how she might approach goal achievement differently today had we been more intentional about developing her resourcefulness. How do children learn resourcefulness? Why is it important to lifelong success? 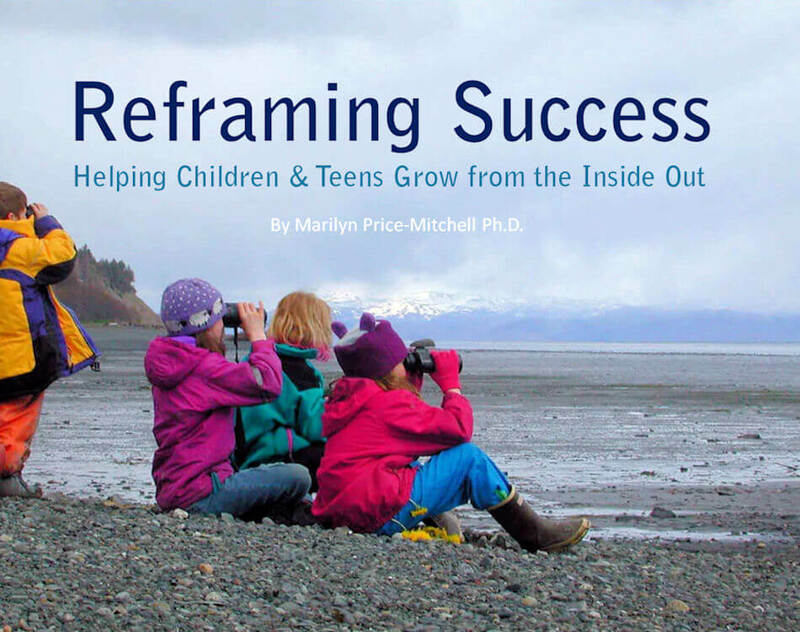 How do parents help children achieve goals AND teach resourcefulness at the same time? Research shows that our ability to be resourceful individuals determines and shapes our futures. 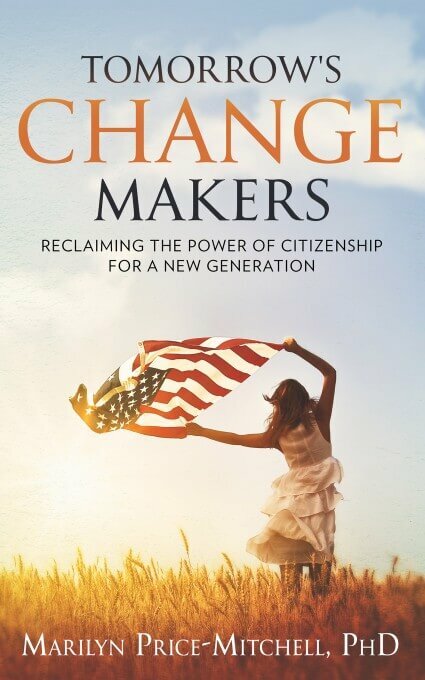 What parent doesn’t want their children to be conscientious creators of their own lives—to achieve desired goals? Children learn to use and apply knowledge as they gain skills in planning, organizing, decision-making, and problem-solving. Together, these skills are the building blocks of resourcefulness. When children can imagine multiple outcomes, set their own objectives, experiment with new approaches, and negotiate challenges, they make important connections between knowledge and goal achievement. High grades and test scores are not reliable indicators of resourcefulness. In fact, most of us know bright college graduates who struggle to resolve everyday problems. Being resourceful takes more than cognitive skill. It takes the ability to process information emotionally as well as intellectually. 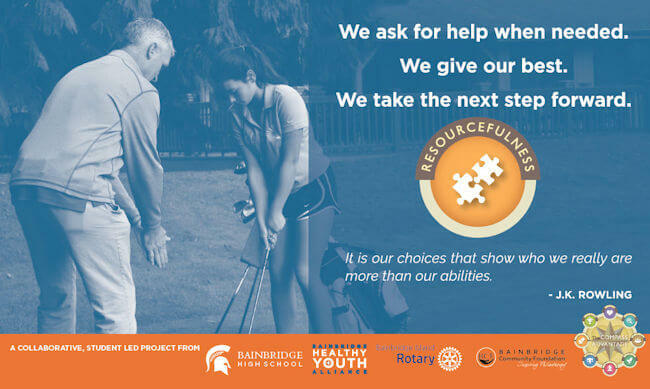 Students from Bainbridge High School in Washington State chose the photo, words, and quote for the above RESOURCEFULNESS banner — one of seven that hang in the hallways of their school to remind all students of the core abilities that matter most to their development and wellbeing. Research shows that resourceful students are not only better at achieving goals, but also respond better under stress. One study showed that academic stress adversely impacted the grades of students who were not resourceful, but had no impact on the grades of highly resourceful students. 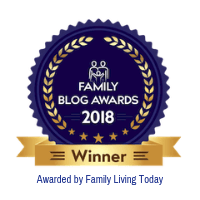 As parents, we help children become resourceful when we walk beside them through the everyday practice of being goal-directed rather than setting objectives and problem-solving for them. When we provide home environments that encourage children to plan, strategize, prioritize, set goals, seek resources, and monitor their progress, we teach them to be resourceful. Through parent coaching, resourcefulness is one of eight core abilities I help parents understand and nurture at home. Below are ways you can start today to foster your child’s resourcefulness and ability to achieve their goals! 1. Share stories of resourceful people. In the words of Tony Robbins, “Success is not about your resources. It’s about how resourceful you are with what you have.” One of the best ways for children to understand resourcefulness is through the stories of resourceful people. What they learn from the biographies of people like Temple Grandin, Richard Branson, and Walt Disney is that all types of learners can be resourceful. Their commonalities include being able to see beyond everyday solutions, not giving up when problems get complicated, and learning from mistakes along the way. Talk with your children about famous and everyday people who are resourceful. What did they do? Why? How did they accomplish their goals? Studies show that perfectionist attitudes can interfere with a child’s ability to achieve goals. Parents help children avoid the pitfalls of perfectionism by focusing on the learning process, not just the result, and by helping kids set realistic goals. Learn about the signs of perfectionism and ways to support a perfectionist child. 3. Apply principles of problem-solving. When children understand four simple principles of solving problems, they learn to apply them in all aspects of their lives. Teach your child how to: 1) Understand a problem, 2) Devise a plan, 3) Carry out a plan, and 4) Look back. Mathematics educator, George Polya, developed these simple principles in 1945 and they are still considered the basis of problem-solving today. 4. Reinforce the power of reflection. “Looking back,” the fourth principle in Polya’s approach to problem-solving is worth reinforcing time and time again. Encourage your child to review her thinking processes. What did she learn? What would he do differently next time? This process not only develops resourcefulness, but also increases a child’s self-awareness. 5. Involve children in decision-making. 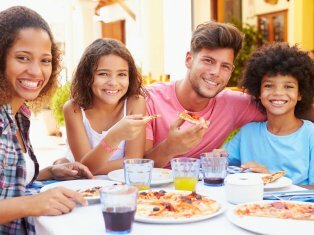 When kids are actively involved in making family decisions, like menu-planning, where to go on vacation, what movies to watch, what service activities to support, how to divide family chores, and the myriad of other choices families make, they learn about decision-making processes, improve skills, and increase self-confidence. They gain experience in debating, negotiating, and communicating thoughts and feelings to others—all aspects of resourcefulness. Families that have regular “board meetings” help strengthen their abilities to collaborate and accomplish goals. 6. Turn science into lifelong learning. Scientific exploration is a fun activity for families—and a perfect way to develop a child’s resourcefulness. When children can choose their own activities, and be involved in planning, decision-making, and problem-solving, their brains grow and develop in ways that serve them a lifetime. Discover how your family can instill the power of lifelong learning through home science experiments! 7. Encourage the use of technology. There is an abundance of technology available that helps children become more resourceful and productive. For example, mind-mapping can help kids better understand problems and devise plans by visualizing connections, outlining different sides of issues, and determining next steps. Electronic planners, note taking programs, and timeline software can help children carry out their plans to completion. 8. Promote independence and collaboration. While independence and collaboration may seem like opposites, both are necessary to become resourceful. Children need to be able to decide what tasks are best accomplished alone and which benefit from teamwork. As your child tackles his next school or home project, ask him what aspects of the project might require collaboration with you or others. Why? When children lead the planning of their own projects, so often managed by parents, they experience firsthand what produces good outcomes and how they learn from their mistakes. 9. Expose kids to positive role models. 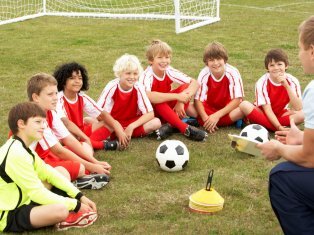 Children learn positive strategies to achieve goals by modeling others with growth mindsets. 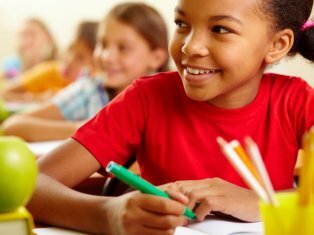 When parents and other family members see themselves as active learners and achievers who accomplish goals through hard work and perseverance, kids also strive to be their best selves. 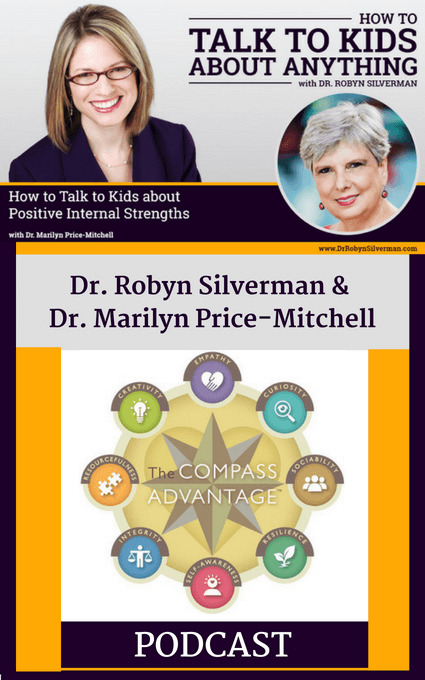 Learn how positive and negative role models influence youth strategies for success. 10. Teach the art of positive skepticism. Being resourceful means developing the ability to look at multiple solutions to a single problem. It also requires a dose of skepticism. When we teach kids to be skeptics—to require additional evidence before accepting someone’s claims as true—we also teach them to be curious and resourceful problem-solvers. Parents can model positive skepticism at home, teaching children to think like Galileo and Steve Jobs. 11. Recognize resourcefulness as a family value. Family values reflect who we are and how we parent. Families and children learn resourcefulness through the practice of achieving goals—working hard, making decisions, and solving problems together. 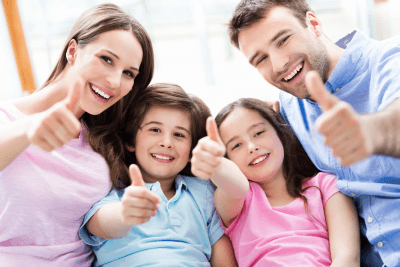 Learn how to articulate family values to your children.